I made a last-minute decision on Friday to go check out a couple of games for the weekend. After perusing schedules in basketball and hockey-land, SW Connecticut looked to be the best option. No new official stadiums were visited, but a 3:30 PM Sacred Heart college basketball game followed by a 7:00 PM Bridgeport Sound Tigers AHL contest lined up beautifully. I started my trek early as there was one pit stop that needed to be made. Instead of taking my usual route to CT via the Tappan Zee Bridge, I begrudgingly took I-80 over the GWB and onto I-95. The reason being was I needed some daytime exterior pictures of the Rothman Center in Hackensack (about 10 minutes off of 80). Despite my annoyance of even making Fairleigh Dickinson’s arena an official visit, I did want some useable outside pictures. After that, it was game on. Tiny Sacred Heart University was the destination, right on the Fairfield/Bridgeport border in SW CT. This was not an official stadium visit as the Pitt Center only seats about 2,000, but I just wanted to see a college basketball game somewhere. I thought the small campus would be easy to navigate, but the after effects of last week’s blizzard combined with no parking near the gym made it a pain. It was a lengthy walk to the athletic side of campus, but I got there in enough time to settle in for the opening tip. 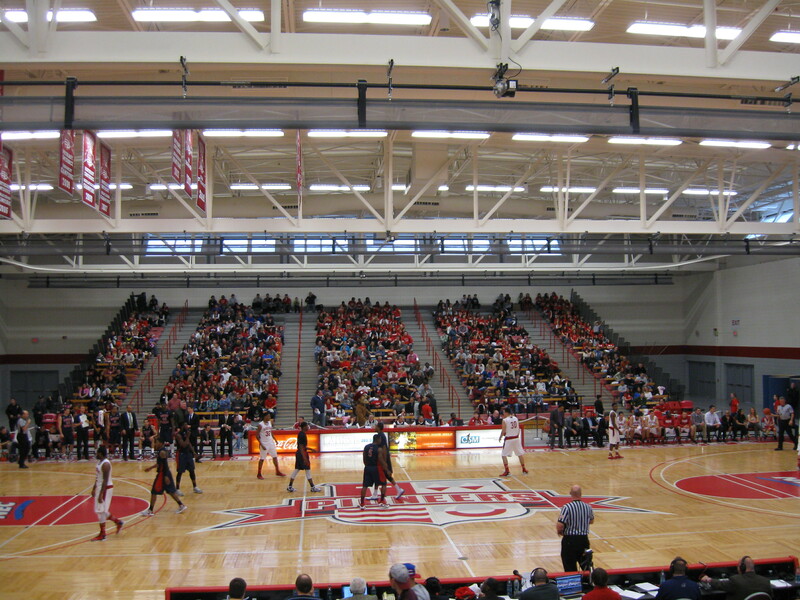 This is a typical NEC gym with sideline seating and walls abruptly behind the basket. The side bleachers sloped gently and started a little ways from the court, so it wasn’t an ideal set-up. Robert Morris was the opponent (my second time seeing them) and they shared the conference lead, along with having the NEC’s best resume, which includes a win over Ohio, along with close losses to Xavier and Arkansas. The Colonials completely outclassed Sacred Heart (9-15, 7-6), even with leader Velton Jones out with injury. Fans were filing out as RMU had a 64-48 lead with 3:49 to play. Then a crazy thing happened. Shots started falling for the Pioneers and with RMU tensing up each possession, Shane Gibson caught fire behind the arc (to my dismay as the screeching PA announcer was too much to handle). The lead was 65-63 as SHU had the ball with under 30 seconds. The furious comeback fell short though as a missed shot followed by a pair of Robert Morris free throws cinched it. It was a cold walk back to the car for the fans, though most took it in stride. It was 5:30 PM, which left plenty of time to make the 7 mile drive down Main Street for Bridgeport’s Webster Bank Arena. I wanted to take Main Street so I could see the city and downtown Bridgeport. You will probably never hear anyone say that. Not much enjoyable to see through a drive mixed with businesses, drug stores, graffiti-ed buildings and shady characters. Regardless, the city is not as bad as the Uncle Chick Band depicts it in 1980. And they built a beautiful arena in 2001 that still shines today. I made a visit here ten years ago, but that was to see a Fairfield basketball game. With each passing year, counting that as an official Stadium Visit always bothered me because this was a downtown arena built for a pro team, not a college team that does not even play in the same town. After 132 stadiums, this was the only one where the main tenant or an equal tenant was not seen, so I decided to erase the original visit from the record books and do an official visit with the Sound Tigers. 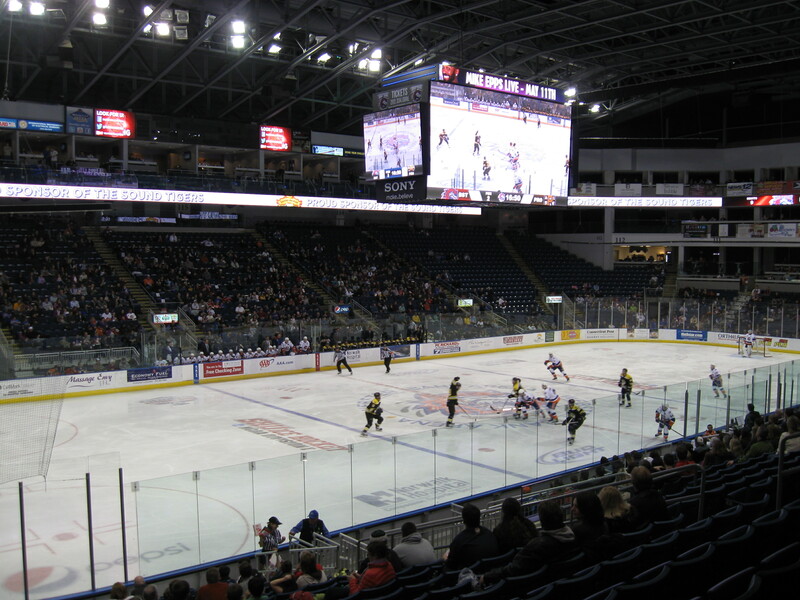 My 11th AHL arena was a good one and I was quite impressed with the inside of the one-level facility. What struck me immediately was the bright object above center ice. Remember last week when I mentioned the growing trend in monster arena scoreboards. Would you believe that was what I walked into in Bridgeport!?! After no center scoreboard for their first 11 years, a gorgeous 30ft x 16ft video screen sits in the middle with crystal clear video. Paul Swaney was right in that it was not distracting and I welcomed the chance to see replays in amazing form. As for the rest of the inside, I can’t say enough good things. On the surface, it seems like there is too much luxury seating, but digging deeper, it turns out that much of this is open to the public which is awesome. There’s a surprisingly spacious bar tucked in the back of section 103, to go along with the Harborview Pub on the tiered deck behind one of the goals. This is the best part of the arena as the two levels provide an area to hang out, eat, drink and also watch the game. Seats overlooking the ice are available along a table and though pricey, it offers a great view. The place was empty enough for me to check out the game up here for a period and it was great. My negatives of the arena are comparatively minor (except the atmosphere)…the box office being outside where it’s cold half the year, not enough displays in the concourse, a blah atmosphere/small fan-base and high prices. Overall though, a very quality AHL facility that I enjoyed. Very special thanks to Brianne Tompkins on a last minute response. I’ll have a full, detailed review of the Sound Tigers and Webster Bank Arena up within the week, along with my updated review at Stadium Journey soon as well.